Free-floating rather than set, this dainty flower's petals and leaf mimic the movement of real blooms. All the sweet charm of tiny blossoms sparkles from artist Eileen Baumeister McIntyre's gemstone flower necklace. Her training in botanical illustration, imagination, and jewelry-making skills all came together to create a new way of making flower jewelry that mimics the natural movement of real blooms. 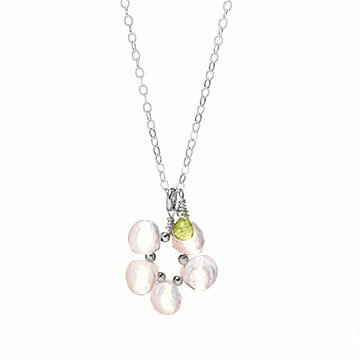 This blossom's dainty pink petals are rose quartz stones strung in a flower shape. The leaf is a tiny drop of peridot hanging from the chain. Free-floating rather than set, they catch and reflect the changing light—never the same way twice. 18" sterling silver chain. Handmade in Long Island, New York.